The extender can be adjusted up to 1-1/2 inches for a flush mount and neat finish, with smooth, non-metallic side walls that enclose the device completely, creating an insulating barrier between the device and existing walls. 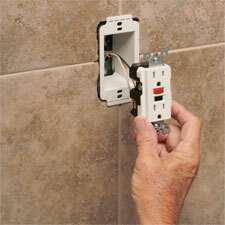 This allows contractors as well as do-it-yourselfers to pull out an existing electrical box to fit a new wall covering without having to remove or reposition the box in the existing or new wall. By extending the box outward, the extender also means the device itself does not need to be moved or re-positioned, while the extender itself may be trimmed if necessary, to accommodate specific or particular size requirements. If working with multiple gang boxes, one needs to simply trim off sidewall for each extender in the place where that sidewall would be between adjoining wiring devices. Arlington’s extender is compatible with all standard outlets including GFCI receptacles, allows contractors to comply with 2002 NEC Article 314-20 and carries a one-year manufacturer’s warranty. The product is CSA LR49636 and UL E170558 rated and compliant.